A little while ago, I received an email from some long-time RVers. 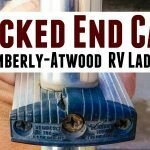 They offered to send me out a sample of their new product for hanging things off the RV called the Ladder Gadget. I usually get offered gadgets like these, and they look cheaply made and flimsy, and I pass. However, this one seemed amazingly well put together with quality material. Once I got down south for the winter, I had them ship one to me. 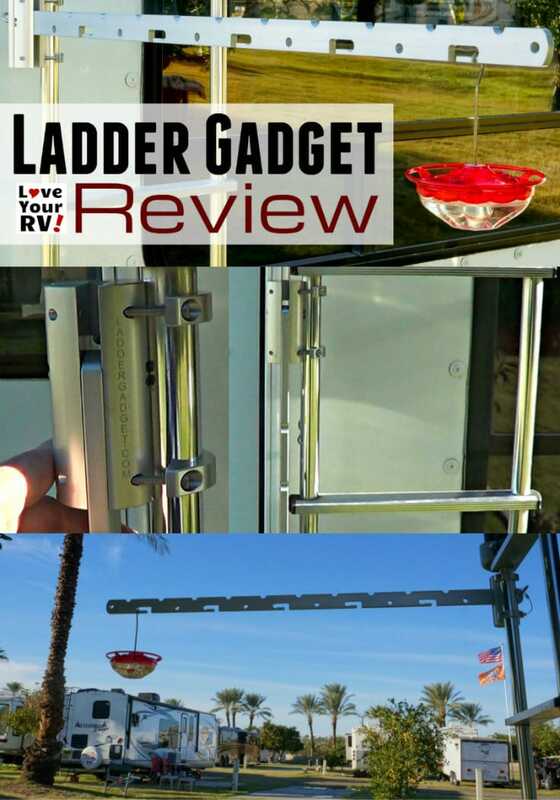 The Ladder Gadget is a folding aluminum arm that attaches to the standard RV rear ladder. It weighs about 3 lbs and is around 3 feet long with holes and notches to hang things on. Installation is quick and straightforward. 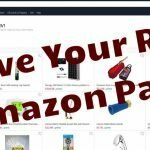 The package comes with two U-clamps, and 4 Allen headed machine screws, plus a safety catch wire. A proper sized Allen wrench is included. I had the thing installed in less than 5 minutes. The Ladder Gadet can be mounted on either side of the ladder, your choice. High-End Materials – The Ladder Gadget is made of high grade anodized 6061 aluminum and uses stainless steel hardware. It’s built to last! Excellent Fit and Finish – All the corners are soft and rounded. 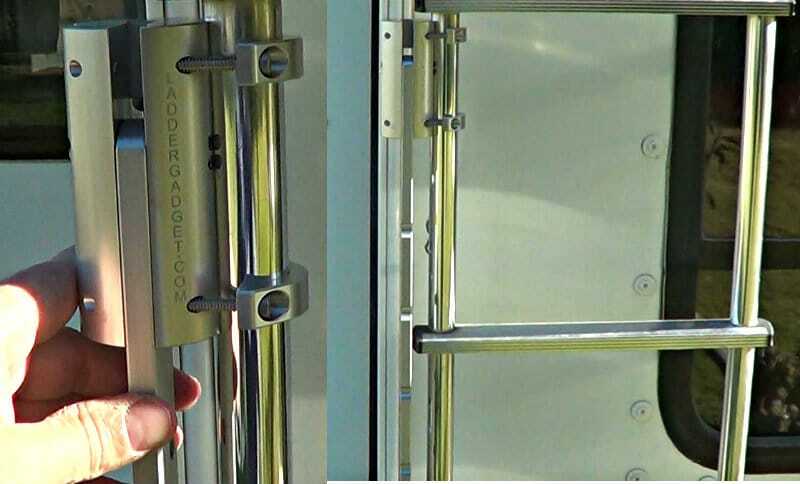 Clamps Securely – Once the screws were tightened, I had no worries about the thing coming loose and falling off. Likely the whole ladder would before this thing would. Lots of Hanging Options – There are many holes and notches to accommodate a wide variety of objects. 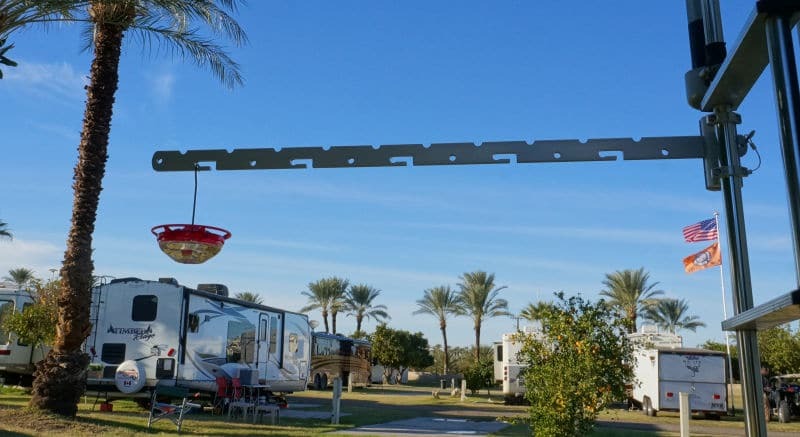 Stays Out of My Way – Unlike other RV clothes hangers, the Ladder Gadget stays out of the way allowing me to still access my ladder to the roof. When folded down for travel, you hardly know its there. Looks Great! – This unit has a pleasing appearance compared to most other solutions. It would look well at home on an expensive coach. It also comes in black. Seems Loose When Folded Down – I noticed in the folded down travel position it had a lot of play. I travel off-road. I’ll be using Velcro straps to keep the lower portion more secure. What Can You Hang Off It? 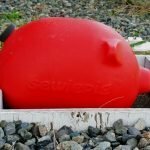 The Ladder Gadget website has a gallery of possible uses. Max weight is 20 lbs. Myself, so far I’m going to use it to hang bird feeders off, teether the beagle to it, maybe a flag and to dry towels and clothes. I’m sure as I go I’ll find more handy applications. I give the Ladder Gadget an excellent rating for quality, functionality, and looks. 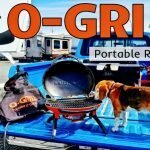 It may be a little more than a casual RVer might want to spend but for RV full-timers like myself with a long payback time, its worth it in my opinion. You would go through many of the ugly cheaper hangers long before this unit would wear out. 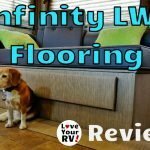 See More Love Your RV! Product Reviews in the archives. 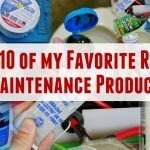 Check out my 10 Must-Have RV Gadgets.